People of China use Gregorian calendar for daily tasks which is followed internationally. 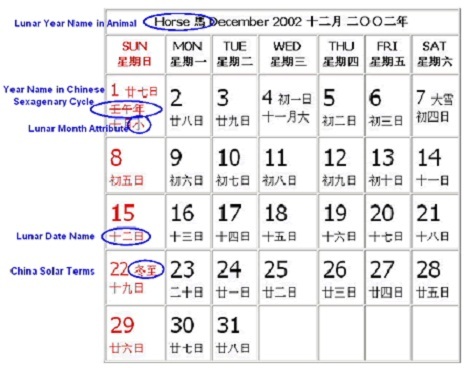 To do transactions with other countries and for government works this is used, but they did not forget the traditional China calendar. For New Year, inaugurations, festivals and other traditional activities the ancient China calendar will be used. The Gregorian calendar is called as Common calendar, Yong calendar, new calendar and the traditional calendar is called giIya calendar, agricultural calendar and old calendar. The traditional calendar of china is made according to the position of sun and moon. It is believed that this had started in the reign of emperor Huangdi in Christ before 2637. The 2011 year of Gregorian calendar is 4708 year according to ancient china calendar. China calendar has 60 years. The names are like first year gia-jhi, second year e-chow, 11th year gia-gju, 12th year e-hi, 60th year guyi-hi etc. Like this after completion of 60 years again the first year comes. The years in china calendar is also called with animal names as 2008-rat, 2009-ox, 2010-tiger and 2011-rabbit year. China traditional calendar starts on 3rd February and ends on 22nd January. New Year starts on 23rd January.